Control of process temperature is accomplished by the measured introduction of cool plant water supply into the unit's circulating system with the simultaneous discharge of "over temp" water to the drain using a cooling control valve (CCV) activated by a control instrument. Pictured above is the AVT valve positioned on the cooling cylinder shown with the thermoformed cover installed. 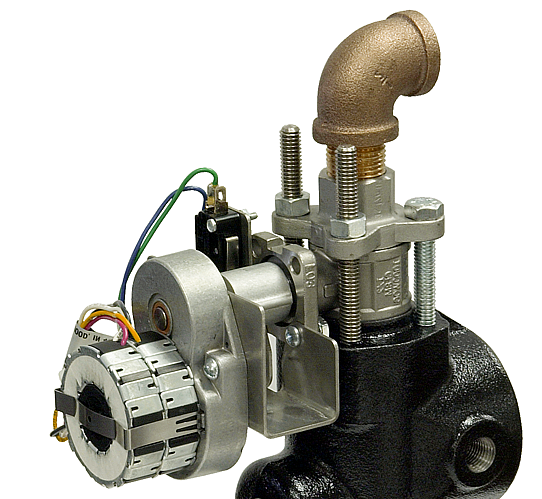 Pictured above is the AVT™ valve shown without the thermoformed cover. The AVT™ is the plastics industry's first and only modulating cooling valve, designed specifically for mold temperature control units. It is a part of an overall patent covering the Sentra temperature control unit. Until the introduction of the AVT™ system, all suppliers of temperature control units used on/off solenoid values as the CCV. The on/off pulsations of solenoid valves causes the "bath introduction" of a slug of cooling water into the circulating system. This slug creates a distinct temperature fluctuation impact until it is blended into the circulating stream. Refer to the chart on the opposite page for related temperature excursions. The system pressure also fluctuates as the solenoid pulses causing a condition know as water hammer. 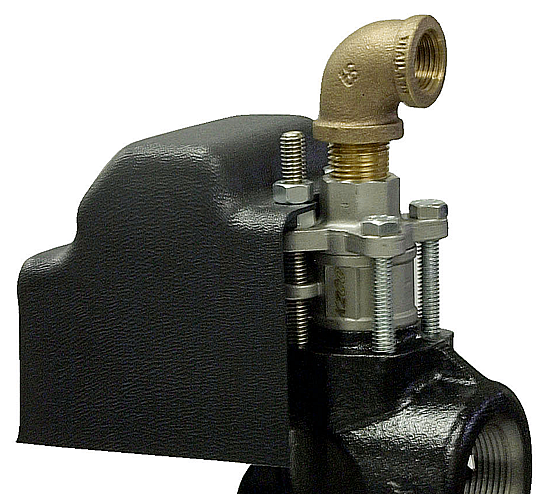 The AVT™ is a motor driven ball valve. The ball valve body is manufactured to Advantage specifications by a leading supplier of industrial valves. Using a custom machined coupling, a motor-gear train assembly is attached to the valve stem, and along with a "home switch", the valve can be controlled by 3000 steps per 90° of valve revolution. AVT™ electronics compensates for lash inherent in all mechanical assemblies. The controller knows the valve's position at all times and is programmed to self-diagnose for malfunction. As the electronic controller learns the dynamics of the heat rejection requirements of the process, the modulating valve orifice is sized to continually maintain the exact cooling flow. No batch cooling slugs, no system pressure changes (water hammer), no over cooling, and no heater cycling to compensate. The AVT™ is the result of 2 years of research and development by Advantage. Using a test fixture, we evaluated and life tested numerous designs and components. at the same time, the electronic microprocessor programming was developed to drive the valve under all expected fluid temperature and process conditions. The orifice rotates constantly, making minute adjustments. The value is mechanically full open or full closed in sudden pulses. Since the AVT™ is consistently 'partially' open, it rejects heat (BTU) in greater capacity than a solenoid valve of the same 'pipe size'. A solenoid controls temperature by being pulsed on and off over time (i.e. on for 2 seconds, off for 10 seconds). It's typically off more than on. The AVT™ is less susceptible to plugging or fouling because particles entering the valve can pass straight through. 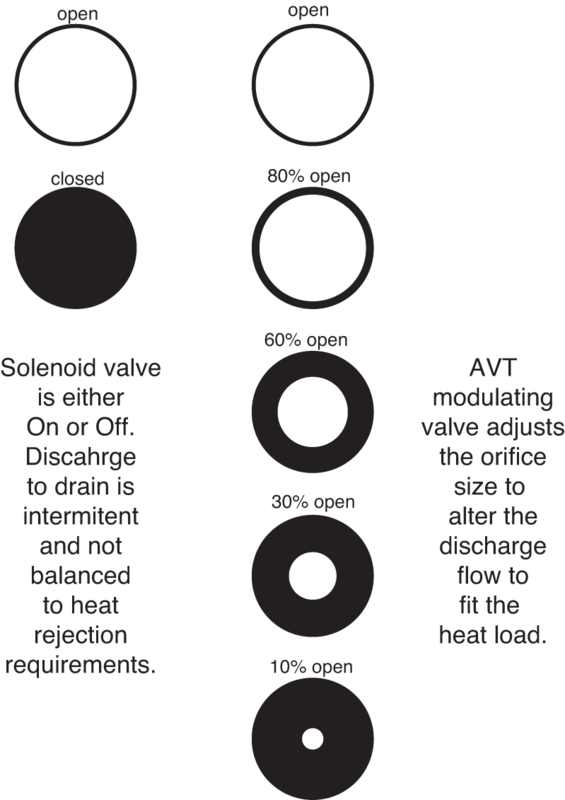 The AVT™ valve actually cleans itself as the ball rotates. Solenoid valves are susceptible to fouling because particles must navigate a serpentine course through the valve body. The small diaphragm pilot hole is readily fouled. Variations in water supply pressure or temperature (or both) are compensated for by the simple reposition on the orifice ball. With solenoid valves, the only compensation possible is to increase or decrease the amount of time ‘on’ and time ‘off’. The greater the pulsation results in increased mechanical wear and also increases the impact of water hammer and temperature fluctuations. Temperature control is a straight line with no cycling. 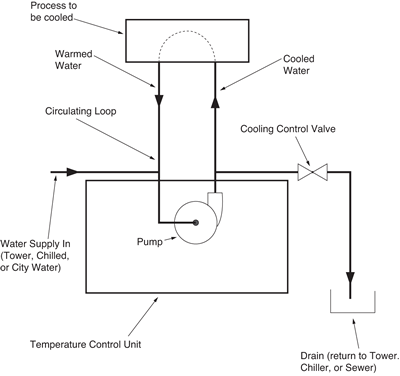 ﻿Batch introduction of cooling water causes the system to cool below the set point. In the absence of a wide dead band, the heater is activated to compensate for the batch cooling. This sets up a condition know as 'cycling', where considerable mechanical and electrical waste occurs. There is no water hammer concussion to create spike pressures which are the leading cause of pump seal failures. Each cooling pulse creates a sharp pressure spike which compresses the pump seal faces increasing frictional and abrasive wear. The Advantage Modulating Valve (AVT™) accommodates all variables with minute orifice adjustments yielding straight line control. 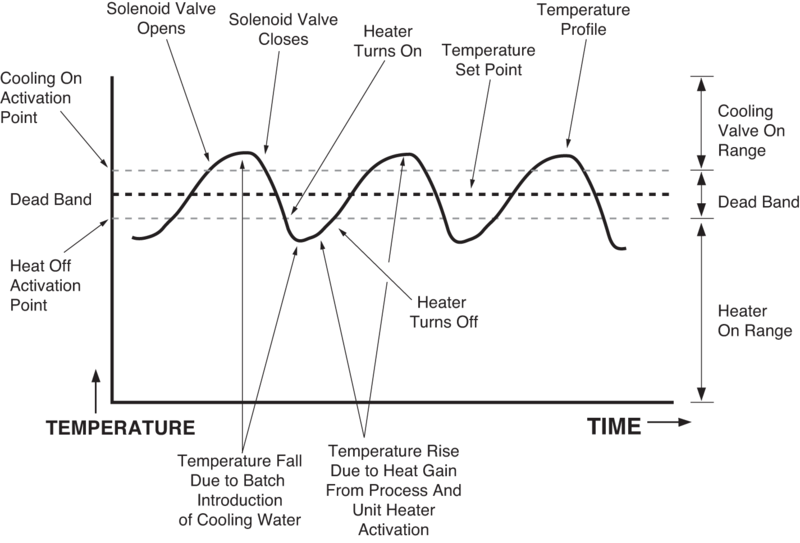 In the solenoid valve system, ALL of these factors, acting simultaneously, influence temperature stabilization. Would you like to Download FYI #002 to your browser?